Set within a high specification, interior designed property, this kitchen was as much about aesthetics as it was about functionality. 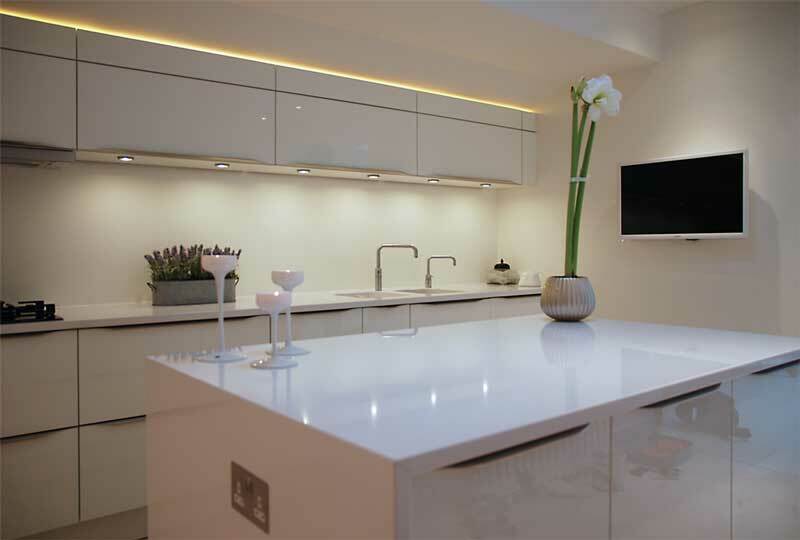 The client was very keen that the furniture should appear built-in, with a small island and white quartz worktops. In terms of functionality a large oven bank with substantial refrigeration was required along with a varied array of drawers, cupboards and pull-outs. To start with the design focused on how to best utilise the kitchen space to incorporate a fairly sizeable ‘wish-list.’ The shape of the room lent itself well to an island type layout, with two entrances, one leading to the lounge area and the other to a large, dining and living area. The flow was easy to achieve by grouping the appliances along the end wall with the gas hob and double bowl sink sitting along the back wall. 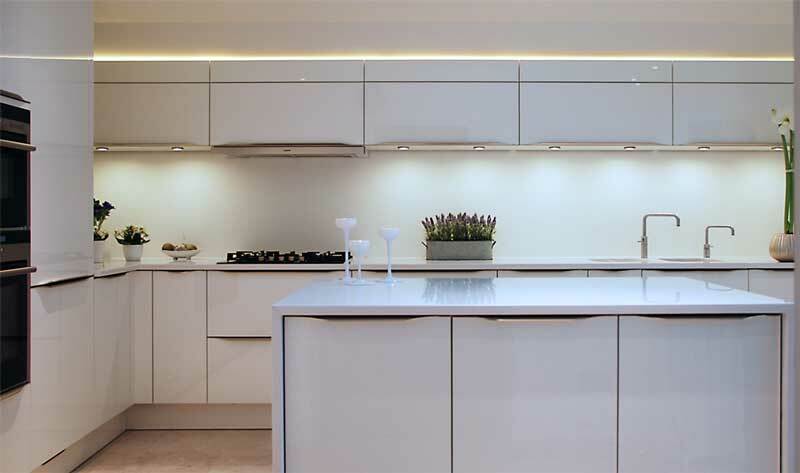 The wall units were to be built-in using ceiling fillers sized to match the door widths, the look completed with LED down lights. There’s a simple, elegant feel to this kitchen. 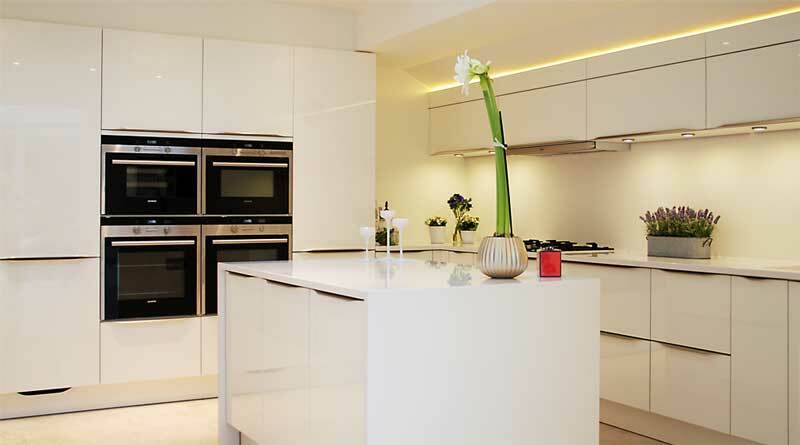 The timeless white furniture and worktops giving our client freedom to play with various accent colours in due course. In fact, when we photographed the kitchen our client was deciding on the glass splash backs and was using the heather as a source of inspiration. 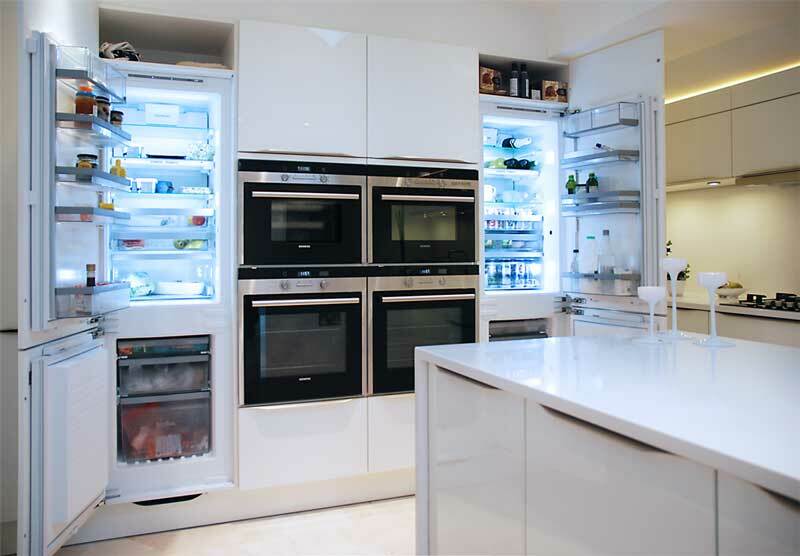 The beauty of white is not only the versatility it offers but the way it maximises the available light. For a kitchen that does not have any windows, it feels wonderfully light and airy. The simplicity of the design conceals considerable functionality with more than ample capacity for even the most serious of cooks. The ceiling fillers above the wall units are a nice detail as are the mitred corners on the island worktops and end panels. Simple, subtle and very, very stylish, it’s another Black Rok kitchen that’s so nice you just won’t want to leave. Read more about what makes a Black Rok kitchen so special.